Today astrology is often seen as harmless fun; the horoscope pages in newspapers or online are something to giggle over with friends. But back in the 15th century, being an astrologer was a dangerous business. Roger Bolingbroke was one such astrologer and magician. He lived in Britain in the early 15th century and was perceived as a very learned man—the Latin he learned as a cleric in Oxford allowed him to consult many ancient texts on astrology, alchemy, and the rather more scandalous skill of necromancy. At the time Britain was a strongly Catholic country and any dabbling in the supernatural was, strictly speaking, heresy. But the lure of the unknown and the widespread superstition of the people meant that many were fascinated by the dark arts. Bolingbroke’s interest in magic came at a high price when he became caught up in a plot against a young King Henry VI. Bolingbroke worked as a clerk for Eleanor Cobham, the wife of Henry VI’s uncle, Humphrey Duke of Gloucester, the former Lord Protector of England and heir to the throne (if Henry had no children of his own). Eleanor asked Bolingbroke and a fellow astrologer, Thomas Southwell, to use their skills in necromancy—the art of communicating with the dead to predict the future—to compile a horoscope on Henry VI. Whether they were just telling Eleanor what she wanted to hear, or whether they really were attempting to divine the future from beyond the grave, we will never know. Whatever happened, what they did next was very foolish. Bolingbroke’s horoscope predicted the likely death of Henry VI, an act that in itself constituted high treason. If true, of course, it would have put Duke Humphrey on the throne, with Eleanor as his queen. When the authorities learned of the horoscope, they saw it as tantamount to a plot to kill the king, and Bolingbroke was arrested. Bolingbroke and Southwell were sent to the Tower of London and most likely tortured. Bolingbroke made a full confession, mentioning Eleanor Cobham. Eleanor fled to seek sanctuary in Westminster, which only served to make her seem yet more guilty, and her situation got even worse when a witch, Marjorie Jourdemayne, came out of the woodwork to reveal Eleanor had sought love potions from her to make Duke Humphrey fall in love with her. The result of the plot was terrible for all concerned. Marjorie Jourdemayne was burned at the stake, while Eleanor Cobham had her marriage dissolved and was forced to march through the streets of London in penance before being imprisoned for the rest of her life. As for poor Roger Bolingbroke, on November 18, 1441, he was taken to the Tyburn gallows, where he was hanged, drawn, and quartered—the pieces of his body sent to separate parts of the country as a warning to others and his head displayed on a spike on London Bridge. 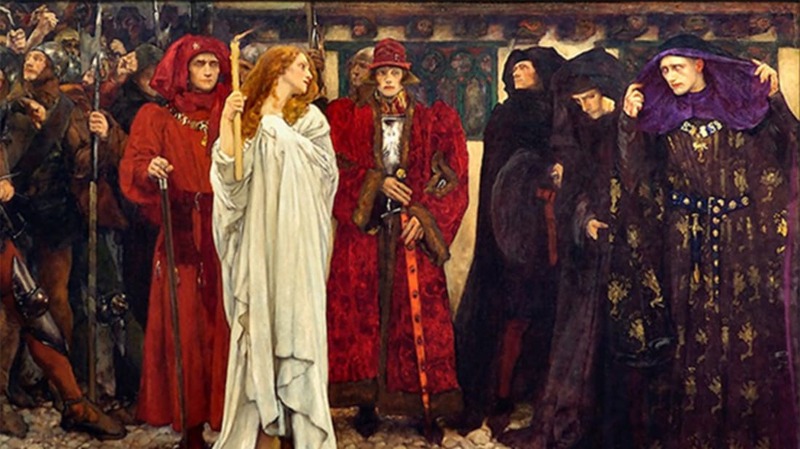 So influential was the dastardly plot that Shakespeare included both Eleanor Cobham and Roger Bolingbroke in his play Henry VI, part II, which he wrote some 150 years later.